During outages, we prioritize repairs to protect public safety and to restore power to the largest number of customers as quickly as possible. Here are the steps we take. We address potentially life-threatening situations right away. These lines supply power to our substations. If a BPA transmission line or substation is damaged, their crews must repair it. Each substation serves thousands of customers. These lines carry power from the substations to every corner of our service area. When main distribution lines are re-energized, entire neighborhoods will have power restored. 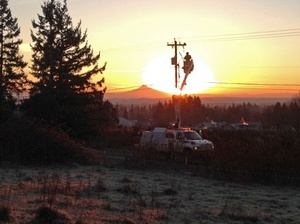 These lines deliver power to individual homes and businesses. In order for your home to have power the transmission line, substation, and distribution line that serve you must all be energized.